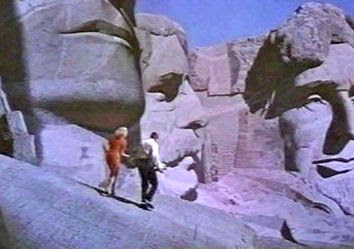 Of all the entertainment supplied by Alfred Hitchcock’s films over the years, perhaps the most entertaining of them all was North by Northwest (1959). 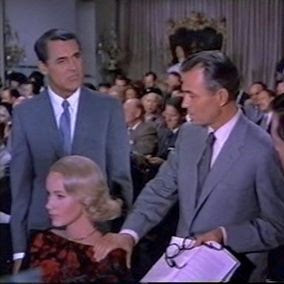 Hitc hcock’s only production for MGM, it followed his usual strategy of engaging recognizable, big-time screen personalities, on this occasion starring Cary Grant (his fourth film for Hitchcock), Eva Marie Saint, and James Mason. In addition, the British-born Hitchcock managed to include such iconic American sites as the United Nations building, the Twentieth Century Limited rail train, and Mount Rushmore. But what made the film most memorable was the action-filled narrative, coupled with Hitchcock’s dynamic cinema styling. In recent years some reviewers have made some nitpicking criticisms concerning the film plot’s plausibility and the degree of realism associated with some of the special effects in the studio-shot action sequences. What these critics are overlooking is the fact that this film was not really intended to be realistic, but was an action-packed Expressionist dream. It captures the realism of a nightmare more than the photographic reality of everyday life. 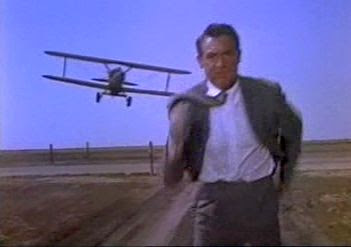 North by Northwest was the second in a sequence of four Expressionistic thrillers that Hitchcock made during this period: Vertigo (1958), North by Northwest (1959), Psycho (1960), and The Birds (1963), and they represent the highwater mark of his career. Note that the Expressionistic effects in these films were not only realized by Hitchcock’s Technicolor-enriched visuals but also by Bernard Herrmann’s hypnotically pulsating film scores. The story follows the perilous circumstances of Roger Thornhhill, a Madison Avenue executive whose life is threatened when he is mistakenly taken to be a US government intelligence agent by an international spy ring. This represented another instance of Hitchcock’s characteristic scenario technique of depicting an ordinary man going about his business, whose life is suddenly turned upside down when he is accidentally drawn into a murky underground world of murder and intrigue. The idea of an ordinary person suddenly overwhelmed by circumstances out of his control gave Hitchcock’s films their Existentialist sense of dread that underlies all existence: that whatever sense of security we have built up over the course of our lives could be entirely cancelled in a few moments. Almost every scene in the film is seen from this struggling protagonist’s point of view. In this case the condition of paranoia is aggravated by the continual issue of mistaken identities which pervades the film. Almost everyone, it seems, is not who they appear to be. Manhattan, the Plaza Hotel (~30 minutes). Roger Thornhill, successful advertising executive, has a business lunch at the Plaza, but is mistakenly identi fied by two mysterious hitmen to be someone else by the name of George Kaplan. They force him into their car and take him to the suburban mansion of Lester Townsend. Townsend wants some sort of cooperation from Kaplan, and when Thornhill angrily refuses, he orders his two hitmen to forcibly inebriate Thornhill and stage a fatal car accident. There is then a spectacular, harrowing drive on a mountain cliff road, with the drunken Thornhill barely able to maintain control of his car. He is fortunately apprehended by the police for drunken driving, thereby thwarting the attempted killing. The next day Thornhill and the police visit Townsend’s mansion, where his wife denies everything and informs them that Townsend is currently at the United Nations. Thornhill now knows he will get no assistance from the police, but that he is still potentially targeted by the hitmen. He will have to go it alone. Wanting to know who this George Kaplan is, Thornhill finds his hotel room at the Plaza and sneaks into it while Kaplan is apparently out, but discovers little other than that he is next headed for Chicago. Then he escapes just ahead of the hitmen. Outcome: Thornhill escapes, needs to resolve the misidentification with Kaplan. The United Nations (~8 minutes). Thornhill rushes to the United Nations building, followed in a trailing taxi by one of the hitmen. When he finds Townsend, he discovers that it is not the man who had interrogated him at his mansion and that the woman posing as Townsend’s wife there was an imposter. Before Thornhill can get additional information, the lurking hitman kills Townsend, and Thornhill is mistakenly assumed to be the killer. Thornhill rushes outside and escapes. The next day, a US government intelligence agency meeting, chaired by the “Professor”, reveals information crucial to the viewer. “George Kaplan” never existed and is a fiction created by the agency to fool foreign spy Phillip Vandamm (who was the man impersonating Lester Townsend at the mansion two days earlier). The agency knows that Thornhill is innocent, but cannot help him without endangering their own imperiled operative working on the inside of Vandamm’s organisation. We now know that the police mistake Thornhill for a drunk and a killer, Vandamm was mistaken for Townsend, and George Kaplan never existed in the first place. Outcome: Thornhill escapes, needs to resolve (a) Kaplan mystery, (b) Townsend (Vandamm) mystery. The Twentieth Century Limited (~23 minutes). Thornhill makes it to Penn Station and sneaks on board the New York Central railroad’s legendary Twentieth Century Limited train. On the train, he meets and befriends a beautiful woman, Eve Kendall, who helps him evade the police and hides him in her cabin room. They quickly become lovers, but Eve turns out be another person who is not what she seems. She sends a secret note to Phillip Vandamm, who is also on this train in another compartment. Outcome: Thornhill escapes, needs to resolve Kaplan/Vandamm mystery, and now romantically involved with Eve. Indiana (~10 minutes). Having arrived in Chicago and with Thornhill undercover, Eve contacts the supposed Kaplan at his hotel and arranges for Thornhill to meet Kaplan at a rural Indiana bus stop. Thornhill goes there, but is attacked from the air by a machine-gun-equipped crop duster in one of the most famous of movie action scenes – a classic of separation, anticipation, and strike. The crop duster crashes, and Thornhill steals a truck to get back to Chicago. Outcome: Thornhill escapes, and knowing that Eve clearly set him up, now needs to resolve the Kaplan/Vandamm/Eve mystery. Back in Chicago (~23 minutes). Thornhill makes it to Kaplan’s hotel and learns that he had already checked out, but he sees Eve in the lobby. Aft er a guardedly cordial meeting, Thornhill surreptitiously manages to find out that Eve is going to an art auction that evening, and he goes there, himself. At the gallery he meets Vandamm again and discovers that Eve is his woman. Jealous, Thornhill informs Vandamm that Eve is a tramp. It is quickly evident that Vandamm’s hitmen are about to polish off Thornhill again, so he causes a ruckus in the auction room and gets himself arrested by the police. But the police take him straight to the airport, where the Professor shows up and reveals to him that Kaplan never existed, Vandamm is a spy dealing in stolen secrets, and Eve is an undercover government agent spying on Vandamm. Outcome: Thornhill escapes and the Kaplan/Vandamm/Eve mystery has been resolved, but he now needs to save Eve, whose supposed amorous fidelity to Vandamm is now perhaps questioned by Vadamm and who is therefore in danger of being exposed and killed. Rapid City (~13 minutes). Thornhill and the Professor fly to Rapid City, South Dakota, where Vandamm has taken Eve to his private house in preparation for leaving the country. To Vandamm, Thornhill is still the actually-nonexistent Kaplan, and Thornhill agrees to continue playing that role in order to help Eve. Thornhill, posing as Kaplan, meets Vandamm at a restaurant, and they talk, but Eve, also present, takes out a gun and “kills” Thornhill, whose body is taken away by the police. It turns out that Eve’s gun had blanks in it, and Thornhill and Eve are reunited in a forest outside town. They embrace, but Thornhill is shocked to learn that Eve is to depart with Vandamm. When he tries to interfere, he is knocked out by a government security guard and taken to a locked hotel room. He manages to escape through a window and heads out for Vandamm’s house. Outcome: Thornhill escapes and is on his own again with the mission of saving Eve. Vandamm’s house (~21 minutes). Thornhill gets to the house at night and, spying through a window, learns that Vandamm has become wise to Eve’s trickery and plans to do away with her. He manages to communicate with Eve, and they try to escape together in car, but a locked gate blocks their passage. So they set out on foot in the woods and quickly find themselves overlooking the top of Mount Rushmore, with Vandamm and his gang hot on their tails. The famous pursuit scene over the faces of Mount Rushmore is unmatched, even for Hitchcock, in terms of tension and excitement. Outcome: Everything resolved, and Thornhill and Eve escape and live happily ever after. At over two hours and ten minutes, this is one of the longest Hitchcock films, but it is action-packed all the way, from the opening scenes to the finale moments. The film opens with images of busy New York crowds rushing to make bus, train, and taxi connections, even as Saul Bass’s famous kinetic titling sequence is overlaying the opening credits and Bernard Herrmann’s driving music is ringing in the background. Herrmann’s pounding music is so intoxicating in this film that one wonders to what extent it was an inspiration for the music of Phillip Glass. In any case this opening sequence, which shows various people missing getting nosed out of their hoped-for taxi and bus connections, including director Alfred Hitchcock in his signature cameo, offers a visual clue to another underlying subtheme (beside mistaken identity) of the film: opportunistic travel connections. Throughout the film, Thornhill is seen jumping into other peoples’ taxis, sneaking onto trains, and stealing pickup trucks and cars in order to make his way. In addition, he is several times opportunistically escorted by the police under false pretenses to the next step of his narrative journey. It is a continuation of the identity issue, the “who am I, really?” issue, because in each case Thornhill is taking a mode of conveyance that was not intended for him (at least according to the normal course of human society). The actual capture of Vandamm and his microfilm containing stolen government secrets is of secondary import to the human story of Roger Thornhill trying to get out of one perilous situation after another. Each of the ministories has its own resolution, but on each occasion, there is new information available to Thornhill in order to propel the ensuing events. 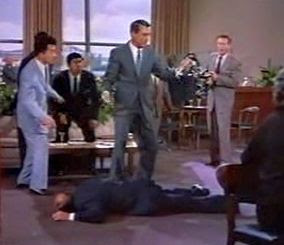 Cary Grant, as Roger Thornhill, was Hitchcock’s favorite actor, and he is just right in the role of Roger Thornhill, although some critics suggested that, at 54, h e looked too old for the part. The problem wasn’t Grant, though, but Jessie Royce Landis, who played Thornhill’s mother, Clara. Landis was 62 years old, but she looked much younger than that (and claimed to be younger, too). James Mason, in the role of Vandamm, is also excellent as a sophisticated and diabolical nemesis. And Eva Marie Saint was the kind of cool, sophisticated and demure blonde that reigned in the 1950s. Mention should also be made of Leo G. Carroll’s performance as the spymaster. Carroll, in his sixth film role for Hitchcock and well-known to American TV audiences from his “Topper” series, was perfect, as usual, in the role of the scholarly and hyper-rational “Professor”. All in all, this was Hitchcock at his best and is closely comparable in many ways to his masterpiece, The 39 Steps.